You have produced somewhat similar results in the past. Using the hunter-gatherers as the sole representative of Africans, the Eurasian ancestry of other African descendants rises. 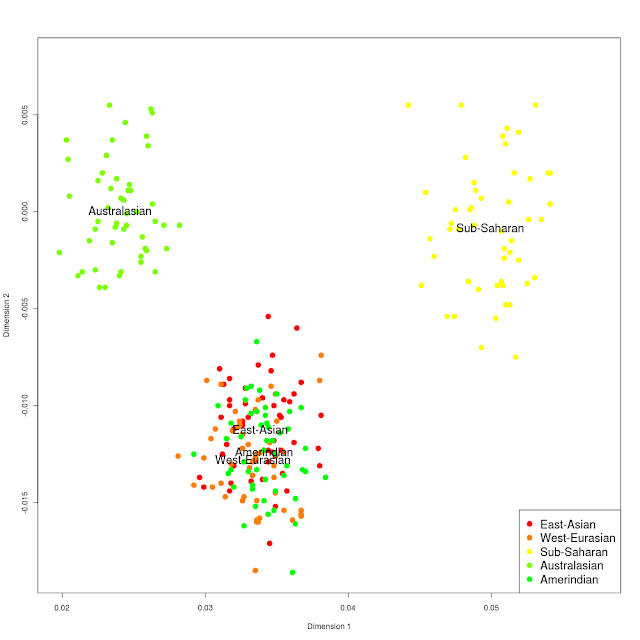 The elevated "Eurasian" affinity in other Africans relative to hunter-gatherers has also been shown in other analyses, such as PCA. I wouldn't be so quick to attribute this to actual Eurasian admixture, though. On the mtDNA side, there is a very significant division between hunter-gatherers and agriculturalists. The San are L0. West Africans largely lack L0, and are split between L1, L2 and L3, all of which are expected to result in a closer affinity with Eurasians. DE (or its ancestor CT) may be of Eurasian origin, but if that's the case then it's strange that they didn't bring any females with them. Another important factor is that hunter-gatherers derive about 2% of their ancestry from archaic hominins. This admixture event took place 35 kya (close to the age of Hofmeyr), and is not found in the Mandenka from West Africa. Hunter-gatherers also carry the identified archaic haplotypes at much higher frequencies than other Africans, where they're infrequent or nonexistent. The divergent archaic haplotypes are found in low frequencies among some Africans with a proximity to hunter-gatherers, but lacking in the Mandenka who live farther north. The lack of this particular archaic admixture should also bring other Africans closer to Eurasians. Also, if the Yoruba are 17.1% more Eurasian than the San, then the little Neandertal ancestry in them detected by Hawks's experiments is immediately explained. John Hawks did not detect "Neanderthal ancestry" in the Yoruba, he detected a greater Neanderthal affinity relative to the Kenyan Bantus. The San were not part of the experiment. The Bantu (Luhya) Kenyans I'm referring to have a higher Eurasian affinity than the Yoruba, I should add. What is your source that the HGDP Bantu from Kenya are Luhya? You have produced somewhat similar results in the past. These are not comparable, since there were not (until recently) any pure Sub-Saharan Africans in the project. When Bushmen, Pygmies, and West Africans are included in ADMIXTURE analysis on commercial SNP arrays, West Africans never show Eurasian admixture. On the contrary, they did bring females with them, who belonged to the L3 clade. Another important factor is that hunter-gatherers derive about 2% of their ancestry from archaic hominins. That is a minor element from a very small part of the genome. It's the smoking gun that can be gleaned from a few short regions of the genome. The actual archaic ancestry in Africans is probably much more, but making the statistical case for it will depend on getting and analyzing more full genomes and -if we're lucky- actual archaic African DNA. I didn't say they are. I said the Luhya have a higher Eurasian affinity than the Yoruba, which is visible in any ADMIXTURE run or PCA plot. The point is that it's from an archaic population even more divergent from modern humans than Neanderthals, and it's lacking in the Mandenka. So this is hardly insignificant. Along with the closer relationship of Niger-Congo people and East Africans to Eurasians in the mtDNA phylogeny (and not just L3), this would adequately explain the higher affinity with Eurasians. Your insistence that all Africans must have massive amounts of archaic admixture is unfounded. Their modern human ancestry supposedly deriving from Eurasia doesn't even fit with your Neanderthal example, where the Luhya have a lower Neanderthal affinity than the Yoruba, despite being closer to Eurasians. I said the Luhya have a higher Eurasian affinity than the Yoruba, which is visible in any ADMIXTURE run or PCA plot. All these are based on SNPs that were ascertained on Yoruba (most commercial SNP arrays). We'll see how they place with full genome sequencing. So this is hardly insignificant. Along with the closer relationship of Niger-Congo people and East Africans to Eurasians in the mtDNA phylogeny (and not just L3), this would adequately explain the higher affinity with Eurasians. It's West Eurasian-specific. That can't be explained by simple Out-of-Africa. Their modern human ancestry supposedly deriving from Eurasia doesn't even fit with your Neanderthal example, where the Luhya have a lower Neanderthal affinity than the Yoruba, despite being closer to Eurasians. The affinity (or lack thereof) of African populations to Neandertals may stem from two sources: Eurasian back-migration or admixture from Homo prior to the Neandertal/sapiens common ancestor (such as that found by Hammer). We don't at present know the relative effect of the two. It is not. The Yoruba are more "East-Asian" in this ADMIXTURE run than any Middle Eastern or European population (excluding Russians). The West Eurasian dominance over East Asian doesn't necessarily mean that the increased Eurasian affinity, relative to the San, is the result of Eurasian back-migration. The difference between San and Yoruba mtDNA is quite significant, and makes it likely that African structure pre-OoA is bound to have an effect. What we do know is that the divergent archaic admixture in hunter-gatherers detected by Hammer isn't found in West Africans. That shouldn't be brushed aside so easily. It is not expected to be 100% West Eurasian, since it did not occur from a current West Eurasian population. But it is 11.7% West Eurasian and 3.9% East Asian (the remainded being Australasian and Amerindian), which is exactly what we'd expect from an unknown Eurasian population that was already well on its way to becoming differentiated from East Asians, but had not reached the maximum differentiation we see today. That makes up a tiny portion of the genome. They fully sequenced a very small portion of the genome. If you shine a light in a few corners of a very large warehouse and find a couple of pennies, that doesn't mean they're the only pennies to be found. We'll see in a couple of years when FGS will be so cheap that it will be used routinely in population studies. That's one way of looking at it. Another possibility is a more recent African affinity in West Eurasians than in other Out-of-Africans. Or these clusters may not capture ancient variation very well, which would explain why we see a sizeable amount of "East Asian" in the Yoruba, but hardly any Australasian or Amerindian. Then again, interestingly enough, Y-DNA D is found in East Asia, but not in Australasia or the Americas. The estimate genetic divergence dates (Table S6.2) from Reich et al. show that the French and Han are equidistant from the Yoruba (in fact, the Han appear a little closer). The Yoruba have a slightly lower divergence date with Neanderthals than the San, but this would be explained by the data from Hammer et al., showing that the San have admixture from hominins more divergent from modern humans than the common ancestor of modern humans and Neanderthals. That could in fact be true, however, there are absolutely no lineages associated with that hypothetical expansion that affected West Eurasians and not East Eurasians. McEvoy specifically rejected a link between his hypohesized "second OoA" and haplogroup E.
If, on the other hand, haplogroup E (or its immediate precursors) went Into-Africa, then the West Eurasian affinity is immediately explained, as is the fact that Eurasians with lots of it, as well as the related D-bearers show absolutely no evidence of special affinity to Africa compared to their non-DE bearing neighbors. Or these clusters may not capture ancient variation very well, which would explain why we see a sizeable amount of "East Asian" in the Yoruba, but hardly any Australasian or Amerindian. This is again well explained by the DE back-migration theory, since DE is absent in Amerindians and Australo-Melanesians, but present in Caucasoids and Mongoloids on which the West-Eurasian and East-Asian components are centered. The estimate genetic divergence dates (Table S6.2) from Reich et al. show that the French and Han are equidistant from the Yoruba (in fact, the Han appear a little closer). This is contradicted by the results of McEvoy et al. as well as this analysis in which SNPs were ascertained in a San individual. The Yoruba have a slightly lower divergence date with Neanderthals than the San, but this would be explained by the data from Hammer et al., showing that the San have admixture from hominins more divergent from modern humans than the common ancestor of modern humans and Neanderthals. Admixture with hominins after to the Neandertal-modern split would have no effect on Neandertal shifts of San. In short, the San would fall on exactly the same position whether they had 10% or 50% archaic admixture, as long as that is descended from the Neandertal-H. sapiens common ancestor. That doesn't make any sense. The E found in West Eurasians is recently derived from African sublineages. The presence of E in Eurasia, and the ancestry of those E carriers, is entirely irrelevant to the ancestry of the males who were part of the original E expansion. Reich's analysis was based on the full genomes of the African and Eurasian samples, was it not? I'd say that holds more weight. Yes, but that is not the case. Hammer specifically looked for admixture from hominins who split prior to the Neanderthal-sapiens common ancestor, and found it in the San and Pygmies. It was estimated that the hominins split from the ancestors of modern humans 700 kya, and mixed with the ancestors of Khoisan and Pygmies ~35 kya. As for your suggestion that the San could also descend from Eurasians, I don't see how that's possible. Their Y-DNA and mtDNA fits with no such scenario, and you don't even believe that their predominant Y-DNA and mtDNA lineages came from modern humans. I'm obviously excluding the recent E-M2 from Bantus and E-M293 from pastoralist East Africans. If anatomically modern humans like Hofmeyr were originally from Eurasia, why didn't they leave any traces in the Y-DNA and mtDNA of hunter-gatherers? I think you should clarify your views on this once and for all, Dienekes, if you would like your hypothesis to be taken seriously. Of course it makes perfect sense. East African populations of today are substantially shifted towards Sub-Saharan Africans. If there was an episode of migration out of East Africa of DE or, later, E, even if it involved primarily males and only a few males at that, we would expect E-rich populations in Eurasia to be African-shifted. We do not observe this. It's more likely that people that were already West Eurasian-like entered Africa from Asia bearing DE Y-chromosomes. That is not the case for the specific ancestry found by Hammer, but finding archaic ancestry predating the sapiens-Neandertal split does not exclude the existence of archaic ancestry postdating it. Actually, it makes the existence of such ancestry more likely, since it would peculiar indeed if Africans admixed with those really archaic hominins and not with the later ones. And, the 35ky date is quite telling, coinciding with Hofmeyr and the UP revolution (which was a Eurasian phenomenon). We don't know what groups of Homo sapiens contributed to the San, because -unlike with Yoruba- we cannot compare them with a more divergent African population. It is quite possible that they are largely descended from early anatomically modern humans of Africa itself, rather than the later back-migration of YAP-bearing humans. If anatomically modern humans like Hofmeyr were originally from Eurasia, why didn't they leave any traces in the Y-DNA and mtDNA of hunter-gatherers? Who says that Hofmeyr is related to the San? I see absolutely no evidence that the San are descended from Hofmeyr, or, even, that they have been in south Africa for that long. Indeed, for the alleged most ancient human population, there are absolutely no remains that could be ascribed to the Capoid type until quite recently, or, indeed to the Negroid type. These are at most Holocene-era racial types. I see absolutely no reason to link them to any particular hominin of Hofmeyr's age. When we find a single skull of Eurasian type (Hofmeyr) in the South Africa, a skull that is completely unlike earlier and later humans of the area and having clear links with contemporaneous or even earlier Eurasians, it is taken as somehow being ancestral to them, when the most reasonable explanation is that it is intrusive. I find that a much better explanation, than a supposed exodus of Hofmeyr-like individuals from Africa that apparently found itself to the Americas by 15ka but had not even managed to replace its archaic next-door neighbors in Central and West Africa. Again; the recent E1b1b1 carriers migrating out of Africa, and their autosomal contribution to West Eurasians, is irrelevant to the ancestry of the original E* carriers. I didn't say it does. I said it would affect the relationship between San and Neanderthals, relative to the relationship between Yoruba and Neanderthals. I agree with the bolded. They were probably migrants from the southern parts of East Africa. So Eurasians, who have actually been shown to have affinities to tested archaic hominins, are suddenly the pristine reference for modern humans? Whereas archaic admixture still hasn't been found in most Africans. The persistence of African archaics in Central Africa and southern West Africa is not evidence for widespread archaic admixture in Africa, just as the archaic affinities found in recent humans from China doesn't necessarily mean there's significant archaic admixture in the Chinese. They must have been isolated from other Africans somehow, or their mtDNA would not have remained so distinct. I don't see how it's possible that humans related to Hofmeyr would not have left a trace anywhere in South-Central Africa. Neither Y-DNA E nor mtDNA L3 are found in the natives of this region, excluding descendants of recent migrants from the northwest (Niger-Congo) and northeast (Afroasiatic and Nilo-Saharan). I thought you said it's "telling" that Hofmeyr coincides with the estimated period of archaic admixture among the ancestors of Pygmies and San? You then go on to say there's no evidence that the San are descended from Hofmeyr. Notably, other than L0, the Khoisan carry divergent L2 lineages (not part of the L2abcd clade) in low frequencies. This would be the closest thing to a Eurasian link, possibly related to Hofmeyr, although that is of course pure speculation. If L3 is from back-migrating Eurasians, that would require a very early back-migration taking place shortly after the origin of L3. Moreover, lineages ancestral to L3 remain firmly rooted in Africa. I don't see how you can remain convinced that L3 is of Eurasian origin, when there's hardly any difference between L3'4 migrating to Arabia and back-migrating as L3 shortly afterwards, and L3 originating in Africa just before OoA. I support the latter because it fits better with the distribution of basal L3 lineages (5 in Africa, 2 in all of Eurasia). "If there was an episode of migration out of East Africa of DE or, later, E, even if it involved primarily males and only a few males at that, we would expect E-rich populations in Eurasia to be African-shifted. We do not observe this." Southern Europeans have non-trivial levels of both several subhaplogroups of Y-DNA E, and of mtDNA L, with a mix that differs between SW and SE Europeans in each case. The phylogeny of the European Y-DNA E subhaplogroups are rooted in African Y-DNA subhaplogroups absent from Europe. There is also a history of African-European interaction through the historic era. Eurasian Y-DNA and mtDNA haplogroups, in contrast, are pretty much completely absent or traceable to the Colonial era in the Yoruba. There is no mtDNA L in populations where Y-DNA D is found (e.g. Tibet and Japan), and there have been a handful of individuals whose Y-DNA could be the root of DE in West Africa. We can archaeologically date the Jomon population in Japan that has a private subhaplogroup of Y-DNA D to ca. 30,000 years ago. We can archaeologically date the initial human population of Tibet that is the likely source of Y-DNA D there today (and shares a common phylogeny with Y-DNA from Southern India and the Andamans more close than the with Japanese subset) to roughly the same era (pre-LGM but long after Out of Africa or the population of Australia which lacks Y-DNA D). Y-DNA D was in Japan well before the founding population of the Americas left Asia, so its presence or absence from the Americas (which had a very small founding population) probably boils down to random chance, not lack of possibility. The likely female counterpart to Y-DNA D where found was very likely originally mtDNA M only. Bottom line: Y-DNA E as back migration from Eurasia isn't a very likely possibility and Southern Europeans are somewhat African shifted relative to other Eurasians at greater geographic distance (as the man walks or travels by boat) from Africa. There certainly have been back migrations from Eurasia to Africa (mtDNA M1 and U6, Y-DNA T and Y-DNA R1b-V88 are some of the best known examples) prior to the historic era. But, Y-DNA E is a poor candidate. "...there are absolutely no remains that could be ascribed to the Capoid type until quite recently, or, indeed to the Negroid type. These are at most Holocene-era racial types." Remains from Ishango ca 20,000 have been said to most closely resemble Nilotic Negroids. "As also indicated by restudy of the Ishango (Congo) fossils , Later Stone Age fossils from at least two regions of Africa retain significant archaic aspects in their skeletons. " The point of McEvoy et al. was that Northern Europeans with barely a trace of Y-haplogroup E were African-shifted. This turns up in all analyses; you can, for example, see in K12b or K7b that in a triplet that includes a West Eurasian/African/East Eurasian component, the first two are always closer to each other. Some population or other has been found to have affinity with every new archaic hominin tested. There's that old saying, that if something happens once, it may never happen again, but if it happens twice, it will probably happen many times. So, if modern humans mated with Neandertals and Denisovans then why wouldn't they mate with the archaic Africans? They may very well be, the point is that Hofmeyr is not their main ancestor because they look nothing like Hofmeyr. I think that you are really smart dienekes.I mean, HGDP exists since several years, and no one before now has never hypothized something like that. Do you think that chromopainter could help with it, or this admixture is too ancient to be discovered? I am really grateful to you, you are opening my mind! "They may very well be, the point is that Hofmeyr is not their main ancestor because they look nothing like Hofmeyr." The fact that San and Hofmeyr are distinct doesn't mean that San couldn't descent from a Hofmeyr-like population. San-looking skulls go back 7,000 years or so. Hofmeyr is 35,000. Nothing prevents a Eurasian population to evolve into a San-looking population under the right environmental conditions. Maybe the San derive from a mix of Hofmeyr Eurasians and an African hominin. In fact, I remember early on Dienekes did an exercise (http://dienekes.blogspot.com/2009/06/colorful-view-of-potency-of-skulls-and.html) in clustering skulls and the San ended up clustering with Eurasians. Also, the fact that San have epicanthus has never been convincingly explained. It's a Mongoloid feature that may be older than other distinctive, craniometric Mongoloid features and it's presence among San may not be a convergence. Hofmeyr could have had an epicanthus. There are other physical features (Mongolian spot, dental shoveling, lighter skin) that pop up in San and may have Eurasian roots. It's fascinating that at k=13, the Dogon of the Sahel look about 85% European and 15% San in this study - images of them, also bear this out, except that they are phenotypically darker than either European or San. I wonder what this says about the peopling of the Sahel? "It's fascinating that at k=13, the Dogon of the Sahel look about 85% European and 15% San in this study - images of them, also bear this out, except that they are phenotypically darker than either European or San." This seems very likely to be an error. The Dogon are not one but a mix of groups in the Bandiagara, some speaking languages of the widespread local Mande family and others Voltaic languages, brought more recently from Burkina Faso in the 1500's (Both Niger-Congo). From what I have seen all Dogon groups are basically within the range of most Sahelian Niger Congo speakers craniofacially and (less ambiguously) in hair texture, including Mandinka and Bamana who have tested overwhelmingly Subsaharan. This data would have them more West Eurasian than the visibly admixed but majority Subsaharan Amhara, Beja and Fulani. This made the Dogon results in Tishkoff et al. unreliable. "There's that old saying, that if something happens once, it may never happen again, but if it happens twice, it will probably happen many times". It seems that Dienekes has now proved that groups of humans have been moving surprising distances around the world since Homo erectus first emerged from Africa.